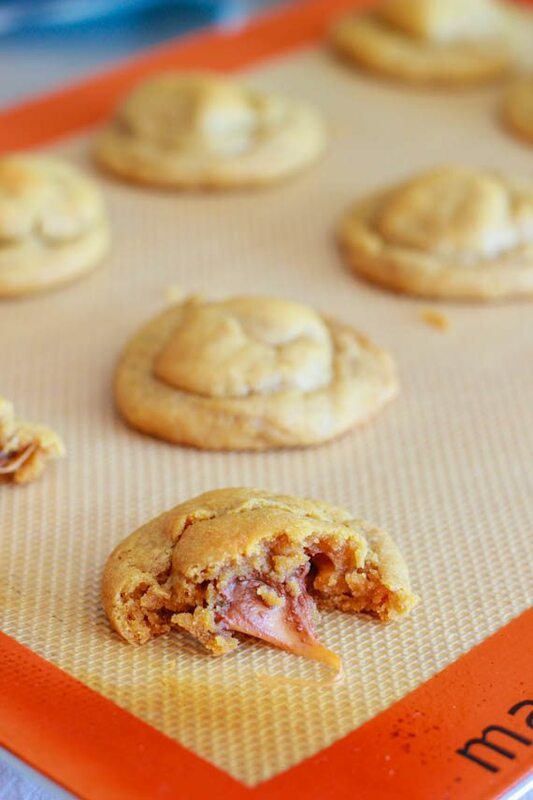 Rolo Stuffed Peanut Butter Cookies–A Guest Post From Sally’s Baking Addiction! Hey guys! So today, I’m super duper happy to be hosting Sally from Sally’s Baking Addiction!! Sally and I became fast friends after bonding over our shared love for cookies, cupcakes and all things sweet. It’s hard not to love Sally–she bakes up things like Fudge Brownie Cupcakes with Cookie Dough Frosting and Cake Batter Cinnamon Buns, but she has a healthy side, too, and is notorious for delicious granola. I’m so excited to have Sally here today and I know you will be, too! Hi The Domestic Rebel readers! Sally from Sally’s Baking Addiction here! I’m so excited that Hayley asked me to guest post on her blog today. She and I certainly share a passion for baking, but we also share a passion for using cake mix as a recipe shortcut, peanut butter, all things cookie dough, and adorable cupcakes. If I ever am in need of a creative cupcake recipe, I always head straight to Hayley’s extensive list of cupcake recipes. It’s like a dessert-jackpot! While I don’t have a cupcake recipe for you today, I have something that is definitely Hayley and reader-approved. I love to make and eat cookies. Cookies are like a blank canvas for pretty much anything. Chocolate chips, marshmallows, candy bars, butterscotch, you name it. They can be mini, large, or the size of a pizza. They can be soft, chewy, thick, crispy, covered in frosting or rolled in sprinkles. But most importantly, they can be full of peanut butter and stuffed with Rolos. Because… why not? This is the second time I’ve made these cookies. The first time was much too long ago, and with a bag of Rolos sitting in my pantry, I knew I had to make them again for you today. The basic peanut butter cookie recipe produces VERY puffy and VERY soft cookie. Thick, chewy, & soft are all necessary components of my cookies! Top the cradled Rolo with some more peanut butter dough and you’ve got yourself one monster cookie dough ball with a sweet caramel surprise hidden inside. That first bite, warm out of the oven, will make your head spin! Such thick cookies with warm and melty chocolate & caramel inside. How can one resist? This is one Hayley-approved cookie that I’ll be sure to bake again and again. In a large bowl using a hand-held mixer or stand alone mixer, cream the butter and sugars together. Stir in the peanut butter, egg, and vanilla (in that order). Slowly mix in the baking soda and flour. Do not overmix. Chill the dough for 30 minutes. Preheat oven to 350 degrees. Take 1.5 tbsp scoop of the chilled dough and split in half. Stick a rolo on the bottom half, kind of like a “cradle” as shown above. Top the rolo with the other half of the scooped dough and seal down the sides so that the rolo is securely stuffed inside. Repeat with the rest of the dough and all 24 rolos. Bake for 9 minutes. Allow to cool completely on a wire rack. If you enjoyed these cookies, be sure to check out my other cookie recipes at Sally’s Baking Addiction! How did Sally know that Rolos are like my favorite (chocolate) candy EVER? These cookies look amazing–so puffy and soft! And with the caramel oozing out?? I’ll take two, thanks. Great job, Sally! I think I just drooled a little bit! These are killing me! I want one now! Please? Soft peanut butter cookies with caramel oozing out of them??? You are right…I can’t resist them!!! These are awesome cookies Sally! I can’t resist gooey desserts. These look crazy good! Yet another great idea, Sally! Peanut butter and rolos?! I’ll take a couple dozen! I love these cookies! Rolos rock. And so does peanut butter anything! these are just too perfect, Sally! the rolo stuffage but the pb cookies themselves – seriously look PERFECT! between the perfect softbatch on your site, and these, you have been making some fab PB cookies! Seriously, she has! I’m beyond impressed–and hungry 🙂 hopefully Aruba can handle all your baking because I think you need to make these, Averie!